'S e cleasaiche às na Stàitean Aonaichte a tha ann an Robert De Niro, Jr. (Eabhraig Nuadh 17 an Lùnasdal 1943). Bhuannaich e an Duais: Academy Award airson "The Godfather, Part II" ann an 1974 agus airson "Raging Bull" ann an 1980. 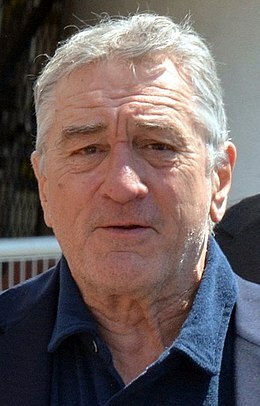 Air a tharraing à "https://gd.wikipedia.org/w/index.php?title=Robert_De_Niro&oldid=543498"
Chaidh an duilleag seo a dheasachadh 17 dhen Lùnastal 2018 aig 06:27 turas mu dheireadh.